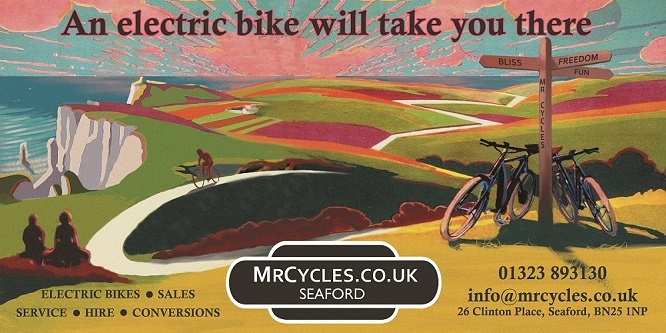 Contact us by phone on 01323 893130, or email info@mrcycles.co.uk, in order to book your electric hire bike. 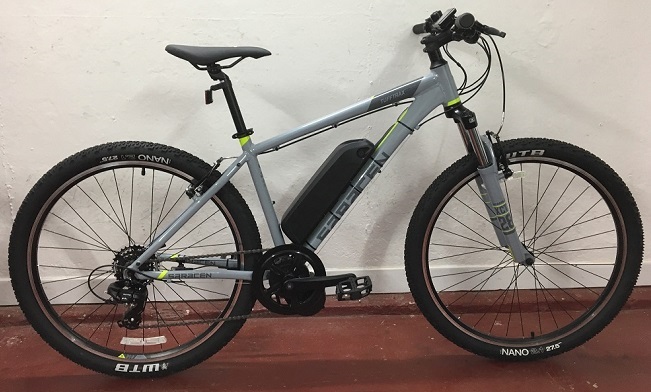 We hire out a range of mountain bikes, converted by us with electric, crank-drive motors, to give you better access to the beautiful South Downs National Park and the country roads of East Sussex. Prices include helmet, hi-viz jerkin, and lock. A puncture repair outfit with a spare inner tube is also available per group if the person hiring feels confident and competent to repair a puncture. Please note all our hire bikes have puncture sealant fluid in their inner tubes to help prevent punctures. You must be 18 or over to hire the bike(s), and 14 or over to ride one. Please read this information carefully before booking. These terms and conditions are between Mr Cycles Ltd and the person hiring the bikes and/or any other members of the group (referred to throughout as the Customer). Mr Cycles Ltd and the Customer are the only parties to this agreement, even if a reservation for the bike(s) may have been arranged by a third party or if a third party has paid for all or part of the hire. The Customer is the sole lessee and is solely responsible for compliance with all terms and conditions contained herein. The use of the word “Equipment” refers to all items hired and includes cycles, helmets, locks and any other items owned by Mr Cycles Ltd. This agreement and the rights of the parties under it shall be governed by English law. Anyone riding an electric bike must be over the age of 14. Persons over the age of 14 but under the age of 18 must be accompanied by a parent or guardian during the hire period. Anyone riding an electric or pedal bike must be physically fit enough to ride a bicycle and also reasonably competent to ride on the road. Customers may be asked to demonstrate that they are competent. If the Customer is worried about any aspect of the bicycle then this must be reported immediately to Mr Cycles Ltd and another bike may be allocated. The customer agrees to pay a 50% deposit in part payment of the hire charge in order to confirm the booking. The balance for the booking is due on or before the hire day. If the booking is made within a week of the hire, the full payment is due. Prices include VAT. The customer also agrees to pay a refundable deposit fee on or before the day of the booking (1 payment per group of up to four bikes) as surety against any additional charges, loss or damage that may be incurred. This payment is in the form of a credit or debit card pre-authorisation. The details are stored securely and the payment will be refunded when all the bikes and equipment are returned to the hire centre in a satisfactory condition (no charge for ordinary wear and tear). The Customer is responsible for any damage and any repair costs will be deducted from the bike deposit. If there is a shortfall then the Customer is liable for the difference. Examples: cost of new bike – up to £1200, cost of lock £20, cost of helmet £30. The Customer will be liable for any loss or damage to the Equipment. Proof of Customer identity will be requested when hiring, e.g. driving licence, passport or photo id. Mr Cycles Ltd reserves the right not to hire to an individual. A helmet is provided free of charge for every customer. Mr Cycles Ltd strongly recommends that it is worn at all times when riding the bikes. Cycling can be dangerous and has risks involved. By agreeing to these terms and conditions the Customer is agreeing to ride carefully at all times. Cycle sensibly, with respect for others and the environment. You are expected to follow the Highway Code. The Customer agrees that they will not operate the bike or permit the bike to be operated whilst unfit through drink or drugs or medication that could affect their ability to ride safely. Mr Cycles Ltd, its employees and/or directors cannot be held liable for any injury to the Customer and/or any injury or damage to a third party. All equipment must be locked to a permanent fixture whenever left unattended. The bikes should be locked using the lock supplied (one lock between two bikes) through the frame of the bike(s) and then to a permanent fixture. Theft of an inadequately secured bike will be the responsibility of the Customer. The Customer agrees not to use a bike for onward hire or reward, nor use it in violation of any law, ordinance or regulation, nor remove it from England without prior written consent of Mr Cycles Ltd. If any of the working parts should become defective whilst riding, the Customer should STOP and call Mr Cycles Ltd who will assist, either to advise or to make a repair or to issue another bike. The Equipment should not be used for racing, mountain bike riding, stunt or trick riding or for any other purpose other than riding to and from a destination. In the event of a puncture or burst tyre, the Customer should STOP riding and either use the spare inner tube & puncture repair equipment provided (if they feel competent), or call Mr Cycles Ltd for assistance. If the Equipment is returned late, Mr Cycles Ltd may levy a late return charge of £10 per bike, or the equivalent hire charge, whichever is greater. If the Equipment is returned early there will be no refund. If required to collect any bikes from another location, Mr Cycles Ltd reserves the right to make a charge for this of up to £100. If the Customer is unable to hire due to illness or other serious reason, the hire may be transferred to another date agreed between the Customer and Mr C.
If the weather is forecast to be heavy rain, then the Customer and Mr C may discuss the hire and decide to either postpone the hire or, if this is not possible, to cancel the hire, in which case a 100% refund will be given (less the administration fee). Light rain or showers will not be considered a reason to cancel.